The Manhattan is a much-loved West End building that has survived for over 100 years. We took the contemporary image a couple of years ago, but fortunately nothing much has changed in the recent past. Lumber baron W L Tait hired Parr and Fee to design this building, as he did with his other significant investment, The Orillia, further east on Robson Street. His other major investment, also designed by Parr and Fee, was his home, Glen Brae, an enormous house in Shaughnessy completed in 1910 at a cost of $100,000. (Today it’s the Canuck place children’s hospice). Completed in 1908, when it opened there were 47 apartments and three stores on Robson street, a bakery, a drugstore and a skirt company. William Lamont Tait was a Scot, born in Dumfrieshire in 1847. His 1913 biography says “In shingle and sawmill business, Gravenhurst and Orillia, Ont, 1870. Came to British Columbia, 1891; operated lumber mills in own name, Vancouver, 1891-1903; sold out to Rat Portage Lumber Co., 1903. Married Jane Gray Donaldson, Orillia, Ont., 1871; has six sons and two daughters.” The Manhattan was started in 1907 and completed in early 1908, with a wooden frame construction, and clad in Clayburn bricks. Our image above dates from 1912. In 1908 the Daily World newspaper listed a $30,000 investment for an addition to the Manhattan which had been completed that year, but as far as we can tell nothing was built at that time. The postcard on the left dates from a little after the completion of the building, which clearly consisted of the structure still standing today. Four years late, in 1912 Tait hired the Jewett Design Co to add what was described on the permit as ‘a four storey building’ next door to the east of the Manhattan costing $20,000. What was built actually had five storeys, so either Mr. Tait went back to the design of his more expensive earlier addition, or Mr Jewitt adapted his design which borrowed the details from Parr and Fee’s original building both in terms of brickwork and bay windows. The 1912 Archives image shows the fifth floor of the additional building under construction, with the frame complete. Today it’s pretty much hidden from this angle by the street tree. Since 1982 the building has been a housing co-op, converted from market rental, with Thompson Berwick & Pratt and Norman Hotson Architects working on the design of the renovated building. We looked at the history of the building that’s here today in a recent post. Jonathan Rogers spent over $500,000; an extraordinary amount in 1911; to build the office block that still has his name associated with it. This wasn’t the first structure constructed here, and as we were aware that Mr. Rogers had acquired property that he didn’t develop for some time, we assumed the ‘meanwhile’ single storey retail that was constructed here was his initiative. We were incorrect; these 1902 stores were built at a cost of $8,000 for Ferrera & Canary. Designed by W T Whiteway, they were soon occupied, only to be torn down less than 10 years after they were built. Our images date from 1910, and probably about a year earlier. In 1901, when the building permit was issued, there were three people with the name Ferrera in the city: Caesar Ferrera was a cook at the Savoy Restaurant on Cordova Street; Tong Ferrera was a waiter in the same restaurant, and A G Ferrera owned it. G Canary was the only Canary in the city, and he owned a store on West Pender that sold tobacco and oysters. (references of the day don’t say if they were smoked oysters). Mr. Ferrara had operated the restaurant in the Savoy Hotel for several year. Caesar wasn’t just a cook – he was chef de cuisine. And Tong was really Antoine Ferrara, he was . 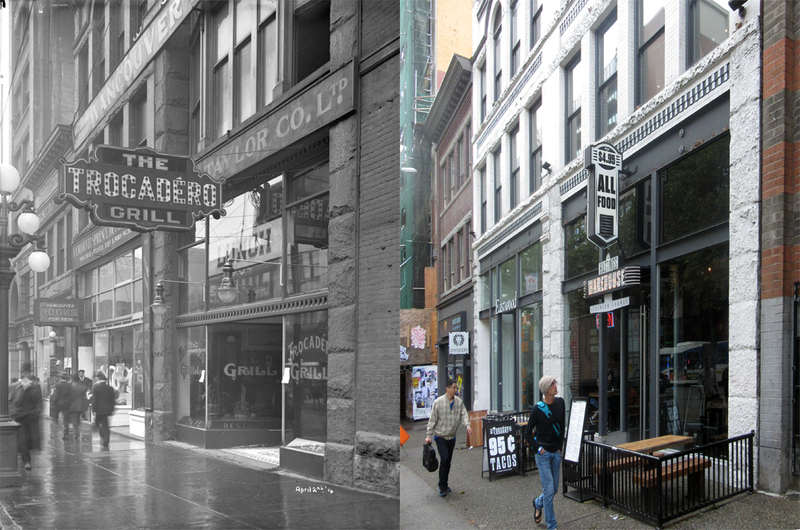 By 1903 somebody else had taken over running the restaurant, and by 1905 Mr. Ferrera was running another another restaurant on Granville Street. Agostino Gabriele Ferrera became Italian Consul to Vancouver a few years later and was a Knight of the Crown of Italy. He was recorded as Augustus G Ferrera in the 1901 census, and although he was born in Italy he had American nationality, as did his American wife Elissa who was at least ten years younger than her husband. (Agostino outlived his wife, dying as a widower at the age of 90 in 1948. The 1901 census shows another Augustus Ferrera aged 14 lodging in the city, and the 1911 census suggests it was probably Agostino’s son as there are two Augustine Ferreras living in the same household, father and son, aged 24, both of whom had arrived in Canada in 1898. In the 1911 census there’s a much older woman, Jeneve, recorded as the older Augustine’s wife, also born in the United States). George Canary, according to the 1901 census was born in Turkey, and had arrived in 1895, when the calculation from his given birth year suggests he was aged 26. His wife, Mary, was Danish and arrived in 1886 when she would have been aged about 15, although her 1959 Death Certificate says she was born in 1880 and so would actually have been quite a bit younger than her husband in 1901. That calculation is complicated by the fact that George’s Death Certificate says he was born in 1874, so was also five years younger than the 1901 census suggests. It also says he was born in Greece – which matches the immigration record that shows him crossing from the US to Canada in Vermont (but headed for Seattle) aged 38 in 1908, born in Laros in Greece. It shows that he had a large mole on his left cheek, and that he had lived in Seattle from 1902 to 1903. His death certificate confirms his employment as owning the Vancouver Oyster and Fish Co. 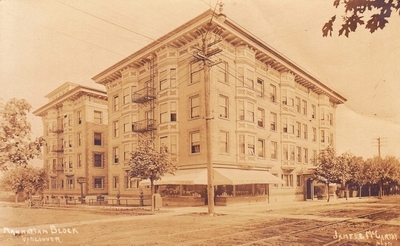 This is the only building that has been redeveloped in a century on the south side of the 100 block of West Hastings. Built in 1986, it’s possible to see what the architect of the new building, John Perkins, was trying to achieve with the design. The building it replaced had elements that weren’t so very different. Built in 1901 at a cost of $10,000 by Hay Brothers, the design was by Thomas Fee for his favourite investor, Thomas Fee. Today there are four rental residential units over 3 stores, but in the 1920s this was home to the Chocolate Shop Café. We’re putting the picture at around 1924 when the Grand Army of United Veterans were occupying the second floor, and the H&E whose illuminated bicycle sign hung over the bikes in the window were Haskins and Elliot. 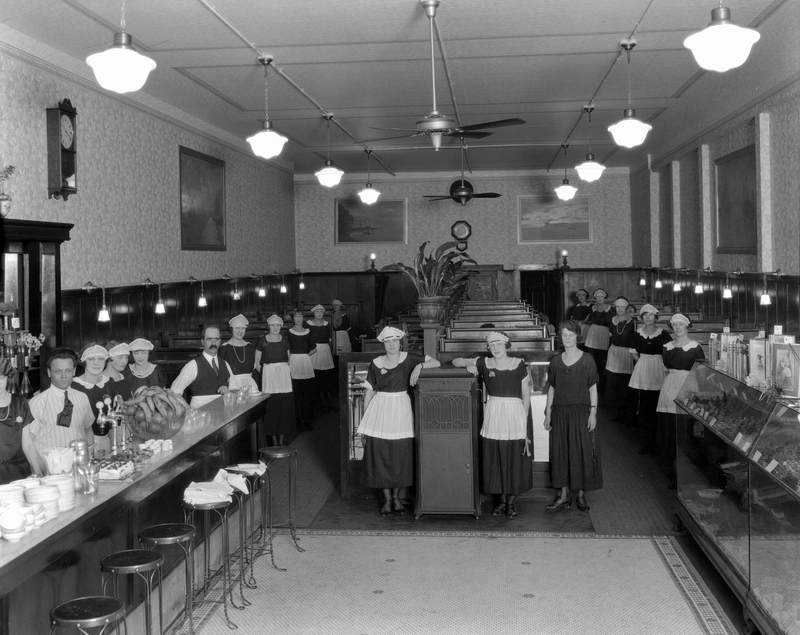 The café offered French Pastries and a soda fountain, and had a significant staff – here they are, lined up for the camera. In 1924 the business was run by Nick and Dennis Sagris. (In 1927 Dennis escaped with his life when attacked by a cougar while hunting on Gabriola Island. “Eighteen charges of buckshot were needed to kill the animal”.) 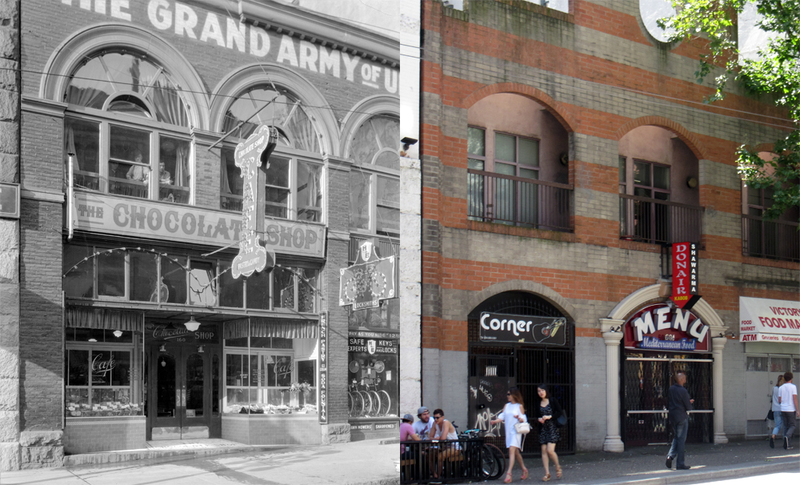 Nick Sagris was running a chocolate shop on Granville Street in 1921 before opening the café. Like the proprietors of the Trocadero café next door, Nick originally was from Greece. Haskins and Elliot had two stores, this one and 800 West Pender, and sold and repaired bicycles and sharpened mowers. Their store moved on soon after this picture was taken; in 1925 it had moved to 44 West Hastings. There aren’t too many passing references to the Trocadero, which was here for many decades from at least as early as 1911. Delbert Guerin recalled that his mother Gertie, of Squamish and English lineage, was hustled into a corner table to be hidden from other customers, and as a result the family never ate there again. In 1936 the restaurant was the scene of a sit-down strike by waitresses who were fighting for unionization, better pay and working conditions. The Women’s Labour History Collection at SFU interviewed one of the strikers, Marion Sarich, who noted that “I was a bus girl, I was working seven days a week at, I don’t know I think it was 25 cents an hour … they weren’t allowed to work us over eight hours but they did … So we started organizing and had a strike. The CP’s Housewives’ League, the Women’s Labor League, and the CP Women’s Auxiliaries supported the stnke, as did much of the general public.” Anita Anderson, another striker and bus girl at the Trocadero remarked that “the police were sympathetic to the strikers because they ate there and got to know the bus girls and the waitresses. The customers became just like a family because they were eating there everyday and you saw them everyday“. There were 138 covers at the Trocadero Grill, which although known in the 1930s as a Greek restaurant with its own bakery, didn’t start out that way. It was initially owned by Donald D McKinnon, who advertised in ‘The Kilt’ in 1916 as ‘A Café for Highlanders, run by a Highlander’. Donald McKinnon was living on Melville Street in 1911, aged 34, with his 24 year-old Ontario-born wife, Kay and their five year old daughter, Kate. He had arrived in Canada in 1901 and the family had four lodgers, Juliet Cooper, Cassandra Walker, Mabel Hutchinson and Ethel Eggar. Before he ran the Trocadero Mr McKinnon appears to have managed the Winton Motor Car Co showroom. In 1914 he acquired the mineral rights of a property in the Peace Valley. By 1919 the Trocadero was run by J Makris, A Ziongas and H Mavris, an had presumably changed to its Greek manifestation. Donald McKinnon had become a manager of the Kincaid, Water Wheel and Power Company. (We know it’s the same Donald McKinnon, because his home address stayed the same). The McKinnon Water Wheel and Power Company as it then became offered a small, powerful wheel attached to a generator for mining operations that was said to be far lighter and easier to utilize than gasoline generators of the day. This was not the only application: the BC Government powered the electricity for the town of Squamish using a McKinnon wheel, and the 1919 report of the BC Department of Railways commented “This may be said to be the first special wheel of this or any type to be manufactured in the Province, and it has proved most satisfactory during the trials, – only a few minor alterations and adjustments requiring to be made.” The company survived well into the 1920s. Today there’s a restaurant again where the Trocadero once operated – part of the Warehouse chain. We’re looking north on Granville in 1939. Looking much darker in those days than it does now, the 1908 Canadian Bank of Commerce is behind the car, and beyond that is the Royal Bank’s half skyscraper from the early 1930s. Closest to us is the Merchants Bank of Canada, built in 1915 in a classical style to make its modest three storeys look more imposing. The large office building on the corner of West Pender is the Rogers Building. It was built by Vancouver businessman Jonathan Rogers, who hired Seattle architects Gould and Champney for his biggest investment in the city. He was born at Plas-Onn, near Llangollen in Denbighshire, North Wales, and grew up speaking only Welsh. At 16 he moved to Liverpool where he worked at various jobs while perfecting his English. In May 1887 he headed for Montreal and crossed Canada, arriving on the first transcontinental train to arrive in Vancouver. Soon after his arrival Jonathan attended the first public auction of parcels of CPR land within the newly created city. He bought four lots outside the area already built at that time, although now located in the heart of downtown. He started work as a painter, and then became a construction contractor. The massive speculation that had accompanied the arrival of the railway in 1887 was soon halted when the economic realities of building a new city set in, coupled with a collapse in lumber prices south of the border. Jonathan Rogers held on to his land through this depression and in 1893 with Samuel and Thomas Hunter built a 2-storey building on Columbia Street, near Powell Street known as the Commercial Block. He became one of the city’s most successful contractors (and was elected to City Council), and over a number of years added a series of modest buildings on West Hastings Street. The Granville building was in an altogether different class. Initially announced as ‘The Glyn Building’, (although on completion it would bear the Rogers name), Jonathan spared no expense on his state-of-the-art reinforced concrete structure (the biggest the city had seen). He toured North America and Europe with the architect, A Warren Gould, to identify the best materials, and understand the most up-to date building finishes and techniques. Gould was a naturalized American, but had been born in PEI. His partner, Edouard Champney, who favoured more elaborate Beaux Arts decoration was French born and trained but from an American family. Rogers completed the building in 1911, and sold it in September 1927 to General F. A. ‘One Arm’ Sutton for a sum “exceeding $1 million” – the largest real estate transaction in the city to that time. Around 1940 he bought it back – although by then his wife Elizabeth was managing the family interests. Jonathan Rogers died in 1945 and left what at that time was a very large sum of money, a quarter of a million dollars, to various causes in Vancouver. The largest single bequest of $100,000 was given to the City of Vancouver to create a neighbourhood park in a poorer part of the city. (Rogers served on the Parks Board for 26 years). After several delays Jonathan Rogers Park was finally opened in 1958 on 8th Avenue, in Mount Pleasant. Today the Rogers Building continues to offer office accommodation to a wide variety of tenants, and although the basement barbers no longer operate, the stores on the main floor continue to thrive. As this image shows, this Toronto-designed bank was briefly a big building on an important city corner. Granville Street was the Canadian Pacific Railway’s showpiece; their station was just down the hill, and their hotel and opera house were to the south. They were intent on moving the city’s commercial centre westwards from the old town of Granville, where the city had first been established some distance to the east of here, towards their own land holdings along Granville Street. 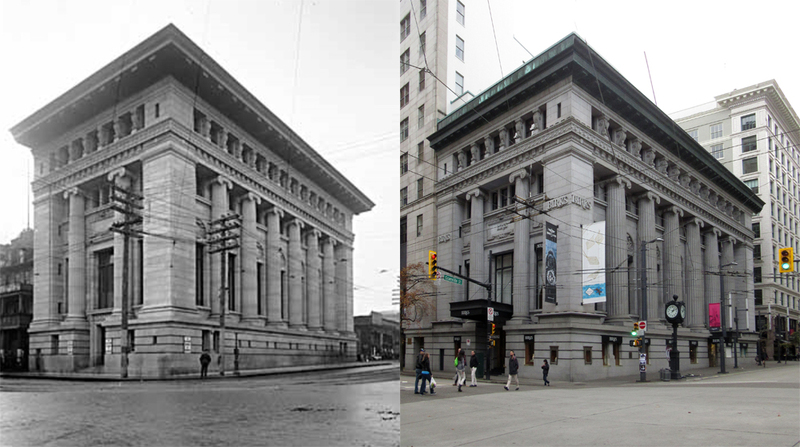 This Vancouver Public Library image shows the newly-completed bank in 1908, designed by Darling and Pearson, the bank’s preferred corporate architects. By 1910 a taller building had been built next door to the east, also designed by the same architects for Canada Life. 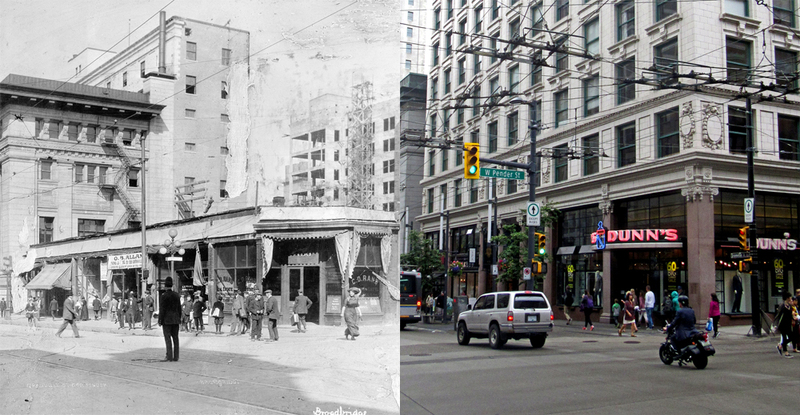 To the south, on Granville Street, Jonathan Rogers built his showpiece office building completed in 1911. Oberto Oberti carried out a careful reconfiguration of the building for Birks Jewelers; the bank operations ceased here in the mid 1950s. The area of the Downtown Peninsula officially known in the Downtown Plan as ‘Downtown South’, (and sometimes called ‘New Yaletown’) has seen some of the greatest change in the city in the relatively recent past. We saw the block to the north of here in a recent post. That looked at a 1981 view of the street; here’s another from the same year. The area in 1981 had mostly single storey commercial buildings, most dating from the 1940s to the 1970s. While there were a few old houses in parts of the area, mostly dating back to the early 1900s, in this part of Seymour Street it was all business property. As with our previous post, the Archives have this image wrongly attributed – this time to Richards Street, and the 1100 block. On the corner is a 1976 structure that recently was home to a vintage clothing store, but in 1981 was ‘Rattan Rarities’. Next door were a series of auto-related businesses; J & M Fiberglass Enterprises, who are still in business in an industrial area of the city, an auto body shop. (The original owner, Jerry Olsen, an expert on Chevrolet Corvette bodywork retired in 2005). The next building was occupied by Cylinder Grinders (who we assume ground cylinders). Surprisingly, (and we suspect for only a short time), the first two commercial buildings are still standing. The former car body repairer became a Japanese auto repairer, but the most recent use for the building was as a sales centre for a condo project on Hornby Street. Perhaps the most obvious difference in spring and summer is the tree canopy – in 1981 there were no street trees. No doubt with the redevelopment of the corner lots there will be even more in future. We’re now mid-block, also in 1981. We don’t know for certain when the garage-like structure in the centre of the picture was built. Until the mid 1920s these seem to be residential addresses, and there were some houses built here according to the insurance maps. Campbell & Grill were running a sheet metal works which the numbering suggests might have been next door to the north. By 1934 The Piston Shop was here, so it would seem likely that this was an early 1930s building. It also looks as if there was some continuity of use here as the 1981 occupants of the building were Cylinder Grinders, who had been located on the block since before 1950. The other company here, White Mine Development were a mining operation. They carried out a number of prospecting drilling operations using diamond drilling during the mid to late 1970s. In 1996 a double-height loft tower was built here. ‘Space’ was designed by Kasian Kennedy for Pacific City Land Corp, with 211 condos in 20 floors. The lower floors have the overheight lofts while the remainder of the tower has standard apartments. Over the years there have been a series of minor development permits to add space to the building to legalize the upper floor platforms that have been installed in many of the double-height spaces. Although in theory the zoning permits the possibility of two towers on this block, this is very unlikely to happen. The location of this tower is right in the centre of the block face with non-market housing to the south and a site to the north limited in height due to potential shadowing of the park across the street.